We have taken time out of our busy lives this month to focus on the income tax debate. We have touched upon static versus dynamic revenue analysis, the present value of money, and the history of income taxes. Today, I will address something that’s been on my mind since the summer of 2008. The question of the day: How did Obama arrive at the idea that an income of $250,000 per year is rich? But where did the amount come from? Either he pulled it out of thin air, or he lifted it from someone else. I think I found the answer. And not only that, I think Obama is completely off-base, and in fact stuck on the idea of ‘wealth redistribution’ by any means, even if by deception. A quick examination of the 1993 tax rate schedules will reveal that the top tax bracket of that year was $250,000, under Bill Clinton’s Omnibus Budget Reconciliation Act. I’m sure that Bill Clinton is flattered that Obama thinks so highly of his budget balancing ability, although it was actually implemented by a Republican Congress, that he would latch on to the top tax bracket of the era. 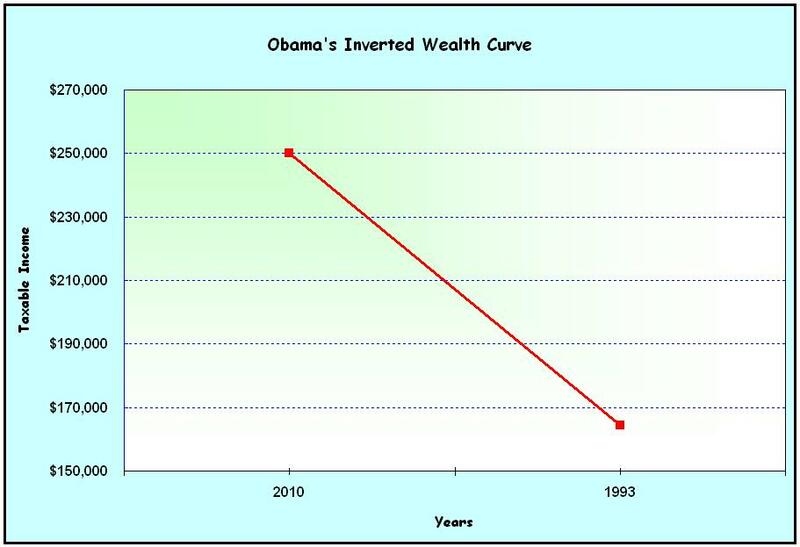 However, the major flaw in Obama’s appraisal is that he has failed to adjust for inflation. In fact, $250,000 of income today was equal to $164,275 in 1993 (calculate it here). And, $250,000 earned in 1993 is the equivalent of $380,460 today. You see, annual inflation over the 17 year span was 2.5%. In fact, the top tax bracket today will be $380,460 when adjusted for inflation. Taxable incomes have been adjusted for inflation every year since 1986. So does Obama have a problem with adjusting for inflation? What Obama has been proposing boils down to this: Instead of allowing people who make over $250,000 per year in 2011 the benefit of an inflation adjustment, he wants to tax them in 1993 dollars, while taxing everyone else in current dollars. The effect is to redistribute wealth through a ‘big government’ sham. In effect, taxpayers who made between $164,275 to $250,000 in 1993 will be pushed into the top tax bracket by 2011. If Obama was playing it straight, he would simply propose to increase the top tax rate to 39.6% on people making more than $380,460, which is exactly what would happen if the Bush tax cuts were to expire without action. But instead, we are being asked to tolerate, as intellectually reasonable, the idea that some taxpayers deserve the benefit of an inflation adjustment, while others do not. We are being asked to lower the bar of the top tax bracket to $164,275 in 1993 dollars. If we are dumb enough to accept Obama’s proposal, in time we will achieve our longed for flat rate tax, but unfortunately the rate will end up being 39.6% for everyone. So it is in the land of n’importe quoi. A land where quarter-millionaires and millionaires are one in the same, and where yesterday’s ‘One Hundred and Sixty Four Thousandaire’ gets to join them. Where is the party of know?